On November 2nd members of the Lake Mendocino Forecast Informed Reservoir Operations (FIRO) Steering Committee1 submitted a major deviation request to Lt. Colonel Travis Rayfield, Commander of the San Francisco District, US Army Corps of Engineers. The purpose of the request is to improve water supply reliability and environmental conditions while maintaining flood management capacity of Lake Mendocino. The deviation request, based on the Lake Mendocino FIRO Preliminary Viability Assessment, represents the culmination of a three-year collaborative effort by the FIRO Steering Committee to produce a significant body of technical and scientific work including watershed and atmospheric observations, atmospheric and hydrologic forecast analyses, and parallel modeling applications. If approved, this deviation would result in a maximum additional storage of 11,650 acre-feet between November 1 and February 28. 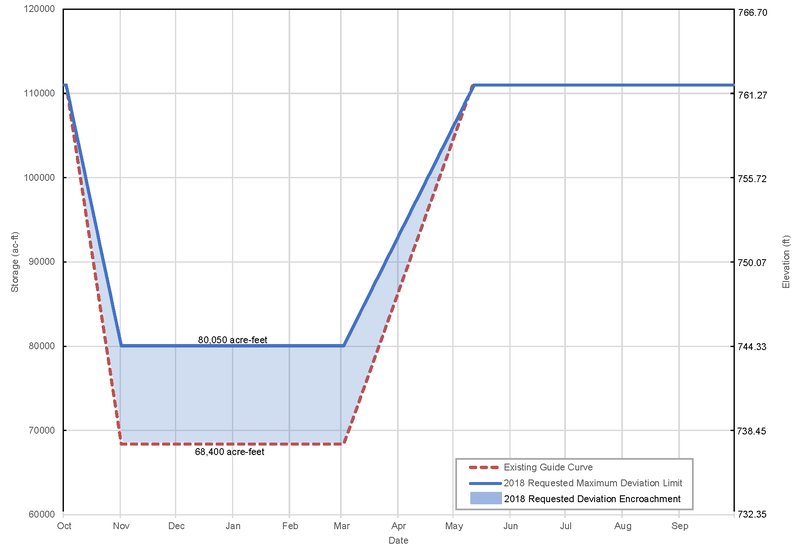 The figure below shows the existing guide curve for the Coyote Valley Dam Lake Mendocino Water Control Manual and the proposed guide curve with the requested changes. Existing Lake Mendocino guide curve (red dashed line) and the proposed guide curve with requested changes (blue solid line). 1 The Lake Mendocino FIRO Steering Committee consists of representatives from the Sonoma County Water Agency (SCWA), Scripps Institute of Oceanography (Scripps), U.S. Army Corps of Engineers (USACE), National Oceanic and Atmospheric Administration (NOAA), U.S. Geologic Survey (USGS), U.S. Bureau of Reclamation and the California Department of Water Resources. This deviation request is being submitted on behalf of steering committee members representing the following organizations: Sonoma County Water Agency, Scripps Institution of Oceanography, US Army Corps of Engineers, National Oceanic and Atmospheric Administration, and California Department of Water Resources.